Already have a HOLMAC machine and want to order parts? Scroll down further to access the downloadable Holmac Parts order form! 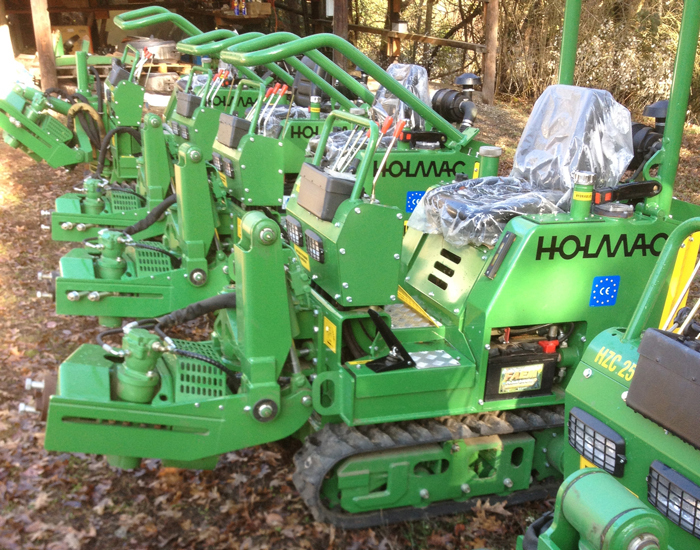 The Holmac Tree Digger is an amazingly efficient tree digging machine manufactured in Italy. It has a high quality, Italian hydraulic system powered by a 22hp, water-cooled diesel engine as well as a rotating, vibrating blade which cuts under the plant and lifts the plant up and puts it on a piece of burlap (that you lay out). Plant Oregon is the US Dealer for the Holmac, and we use Holmacs in our Nursery. The Holmac has made a huge difference in our business. It has given us the confidence that we can get the plants out of the ground when we need to. We are no longer wondering if we can find good diggers on the mornings that we need to get orders out. The Holmac company in Italy is truly wonderful to us and has always been helpful, kind and generous with the owners of the machines. The factory has expanded in the last few years to meet the demand for the Holmac and is better than ever, making minor upgrades to the digger as time goes by. The machine we sell today is nearly identical to the first one we bought in 1994, which is alive and healthy and working every day right here in Talent, Oregon. Does digging trees trash your fields? Hand digging creates oversize holes and big piles of soil. Driving, working or walking where trees have been hand-dug is tricky and dangerous. Repairing the damage is costly. You know what a tree spade can do to your roads and fields, as it tears up the area and compacts the soil. This machine provides a real competitive advantage in the nursery industry. With a footprint of only three feet by five feet, it can easily maneuver between rows and trees while working. The rubber tracks apply a mere two pounds per square inch to the ground, so it can drive across beds or work close to plants without compacting the soil the way heavy tractors or tree spades do. Working steadily down a bed, The Holmac can extract 30-60 balls per hour, 240 to 480 balls per day! The fastest reported number of balls dug per day is 800. It is easy to see how this machine can radically reduce labor expenses -- up to 75%! We have several Holmac Digger units to offer, and depending on your needs we can help you select the model best for your situation. Our old base model the HZC 16-22 is no longer in production. However, we sometimes able to provide information about used HCZ 16-22 units that are available. HZC 24 digs up to a 32" rootball (call for price quote). HZC 25 digs up to a 36" rootball (call for price quote). HZC 29 digs up to a 44" rootball (call for price quote). These machines come with 3 blade sizes of your choice from 10" up to the largest size available for the machine you choose. A tool box is also included which has the large socket wrench for changing the blades, and a few tools which are handy to have for regular maintenance. These machines have dependable Kubota engines, Bridgestone rubber tracks and high quality components throughout to insure many years of reliable service. Just keep this machine greased, filters changed and you will enjoy many years of profitable service from your Holmac. I know because we use them all winter long for harvesting in our nursery. The key to this Machine is the fact that the blade vibrates at a very high speed and just cuts through the ground like warm butter. I have seen the blade cut through roots 4" in diameter (not that the plant was too thrilled about it). Want more information? Please send an email to Holmac@plantoregon.com with your name and mailing address, and information about which model you are interested in along with any questions you have, and we will respond and mail you some brochures! Already have a HOLMAC and need to order parts??? Please fill out as much information as you are able! This helps us process your parts request quickly and efficiently, which helps us to serve you better in whole! After you submit your parts request, a Plant Oregon staff member will respond to you via email and let you know about what we have in stock, and expected shipping times. Thank you for your interest in our HOLMAC machines! We look forward to serving your Holmac needs! View our HOLMAC Tree Digger in Action Here!